Beekeeping Hrastar was started by our grandfather Anton, back in 1950, with just a single beehive which he received as a present. Ever since, members of the Hrastar family have continued to spread their love of honey, and the family practice of beekeeping. Traditional beekeeping in line with nature, without excessive use of modern technology, is what we believe in and strive for. We want to keep our business small, and our products accessible to those respecting the bees’ hard work, and the purity of our 100% raw and locally sourced products. Our Carniolan honey bees live in their natural environment, far away from urban centres and pollution. Their produce is available in limited quantities only. Anton always said "Made by my bees, bottled by me." Our 100% raw forest honey is a mixture of different kinds of honeydew our bees gather from the trees in the forest which is situated very close to our apiary. This is why we normally have quite big amount of forest honey per season. It possess strong flavour with a woody taste. It is delicious in combination with bread and pancakes. 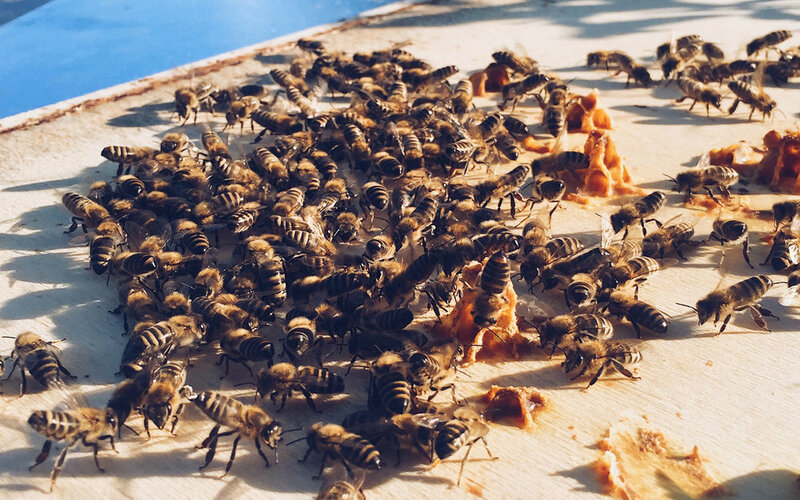 Our 100% raw chestnut honey is made of honeydew our bees gather on chestnut flowers. It is a mixture of strong aromatic and bitter-sweet flavour. It is very rich in pollen content and perfect for baking sweets, in combination with ice cream, milk or cheese. Beeswax is a natural wax produced by our bees. We use it to produce comb foundation, but it can also be used to make candles and soaps. Our raw bee pollen contains all the essential components of life. It is rich in vitamins, minerals, proteins and lipids. It increases energy, boosts immune system, helps relieve stress and serves as a dietary supplement. It always comes in limited quantities. Our gift range consist of unique hand-wrapped products which are customised for every customer. We want you to feel a unique pleasure of 100% raw and locally sourced goods we offer.